As a person grows older, there comes the inevitable worry of what to do if Alzheimer’s or other forms of dementia take away one’s ability to make sound decisions and carry out daily tasks. Unfortunately, no one knows when or if this tragic situation will manifest, and it may arise before an individual has had an opportunity to make the necessary plans. Family members are often placed in the role of caring for parents with dementia-related conditions, and at some point, establishing guardianship may be necessary to provide for their medical and daily needs. When that point comes will vary by duration of times of lucidity and how cooperative a person is. For those that are easygoing and cooperative, establishing formal guardianship may not be necessary until capacity is completely lost. But for those that refuse care or assistance, guardianship is an early necessity. Further, those suffering from this type of condition likely may not have the ability to recognize how vulnerable they are, nor the understanding to competently execute the appropriate advance directives. Consequently, it may become necessary to petition a court for emergency guardianship. Alternatively, before the dementia completely removes all mental capacity, a person can elect to enter into a voluntary guardianship. An overview of these two forms guardianship will follow below. a person’s property is at risk for waste, misuse or loss if immediate action is not taken. In any guardianship proceeding, a court must determine a person is mentally incapacitated, but for purposes of emergency guardianship, what constitutes imminent danger is a subjective assessment by the judge. 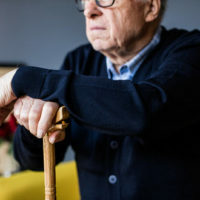 Due to this discretion, it becomes a greater possibility a guardian could be appointed when capacity is still present, and underscores the need to address this situation with an elder law attorney before incapacity is a concern. If a person is still competent, but knows he/she is unable to effectively manage financial or personal affairs due to age or infirmity, he/she can voluntarily petition a court for guardianship. This may be an option for someone in the early stages of dementia that is expected to progress rapidly, or is compounded by other health issues. Before a court will approve a voluntary guardianship, the person seeking to transfer authority must provide documentation from a doctor stating he/she understands what one gives up with guardianship. As in other guardianship arrangements, the guardianship can be a complete transfer of authority (plenary), or be limited to certain areas identified by the petitioner. Before instigating this process, an attorney should be consulted to ensure a full understanding of all the legal implications of ceding decision-making authority to another person. Guardianship is a big step that should not be entered into lightly. Work with an experienced elder law attorney to learn exactly how this relationship works, and the best way to plan for this possibility so your best interests are primary. William Rambaum, P.A. specializes in elder law issues, including guardianship, and can help you or a loved one navigate this complex area of the law. Contact his Oldsmar office today to schedule an appointment.